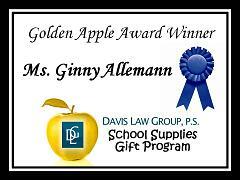 Davis Law Group, P.S., a group of personal injury lawyers in Seattle, is pleased to announce that Ginny Allemann is a recipient of the Davis Law Group School Supplies Gift Program. Ms. Allemann is a librarian at Seattle's Thornton Creek School. The library is the heart of Thornton Creek School. The mission of the library and information program is to promote academic achievement for every student by insuring that students are effective users of ideas and information. Allemann, better known at the school as Miss Viola Swamp, works with all of the teachers, staff and students in the school. Allemann spends hundreds of dollars of her own money each year on out-of-pocket expenses for the library. She plans to use the gift to purchase color copies, magnet paper, colored pencils, adhesive tape, card stock, and other teaching supplies.